Art and painting are a wonderful therapies. I still paint the occasional portrait although due to damaged shoulders I can no longer paint with a steady hand at the easel. 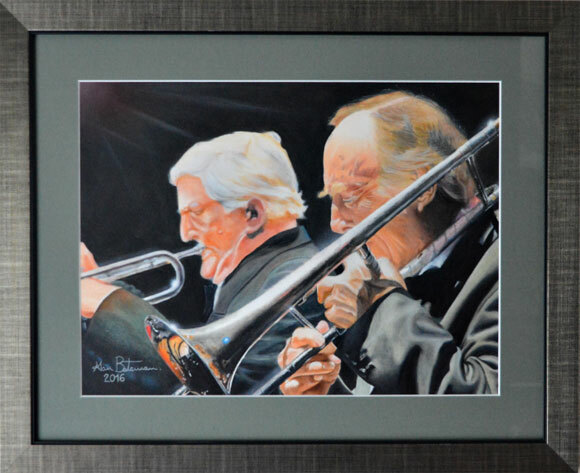 So these days it’s a privilege to feature on Jazz&Jazz Alan Bateman’s superb jazz portraits and here is his latest masterpiece – a wonderfully nostalgic portrait of the much missed Pat Halcox in duet with Chris Barber. It was good to chat with Tim Curtis again yesterday at Lemsford Jazz Club. Sadly yet another pub which closed its doors to jazz after ten wonderful years of hosting great bands organised by Bob Thomas. Jazz&Jazz Giclée Fine Art Prints of the portrait and poem are available for purchase upon request. St Albans, back in the 1950s/60s Hertfordshire was a hotbed of jazz. Potters Bar was home to greats such as Acker Bilk, Terry Lightfoot and Kenny Ball. Chris Barber was even born in Welwyn Garden City. When I moved from Hertfordshire back in August, 2013, Welwyn Garden City’s Peartree Jazz Club was still striving to carry on the tradition. 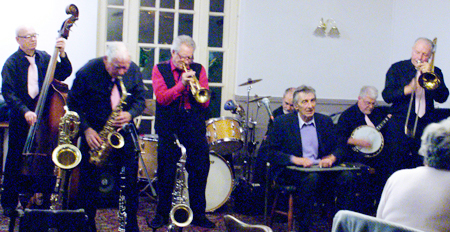 But now even The Peartree is no longer a venue as the club has relocated in Lemsford Village Hall, renamed The Lemsford Jazz Club, restoring a more recent tradition of jazz in The Long & The Short Arm public house. 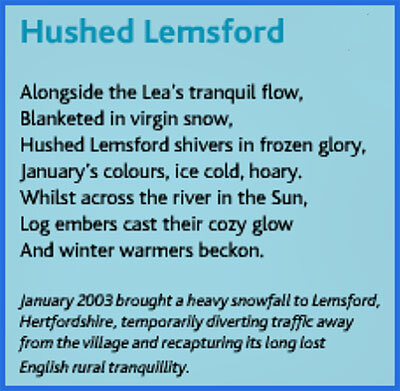 So when we moved from Lemsford Village in 2013 I wondered where I would find jazz in and around Bedfordshire, our new county. I need not have worried because I soon discovered I had moved pretty well central to a “new era” emerging hotbed of jazz, covering a zone from Hitchin, Luton, Bedford itself, to Olney in Buckinghamshire and Blisworth and Wellingborough in Northamptonshire. What has spurred this analysis of regional jazz? Chris Pearce’s Frenchmen Street Band (Photo © Peter M Butler, Jazz&Jazz). 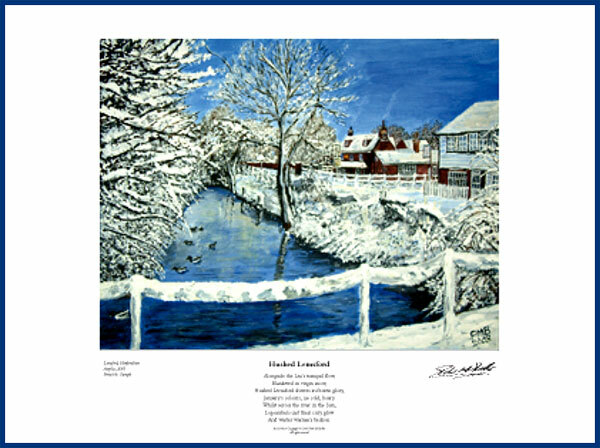 First, the fact that as a youngster Chris Pearce lived in Welwyn Garden City and from his school he could see Lemsford Village from his school playground – even the home we moved from. 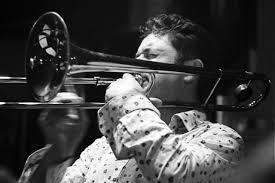 Second, because Chris and his Frenchman Street Band, based in Gloucestershire, star regularly at The Walnut Tree Jazz Club, Blisworth, Northants. Third, because for Jazz&Jazz to feature as many jazz bands as possible without a crippling outlay for long journeys nationwide, I need top rate venues within striking distance of home. Tad Newton runs such venues at The Walnut Tree, Blisworth and The Castle, Wellingborough, in Northants, and at The Bedford Golf Club (even closer to home). Fourth, because Alan Haughton, his colleague and pianist in his band, “Tad Newton’s Jazz Friends”, runs Olney Jazz Club in Buckinghamshire, also within easy striking distance. All four are thriving clubs and I count Tad and Alan among my “jazz hero” friends. Therefore I feature them regularly on Jazz&Jazz, not because I favour them above other clubs and venues, but because due to them I can feature a huge range of jazz bands and musicians on Jazz&Jazz. 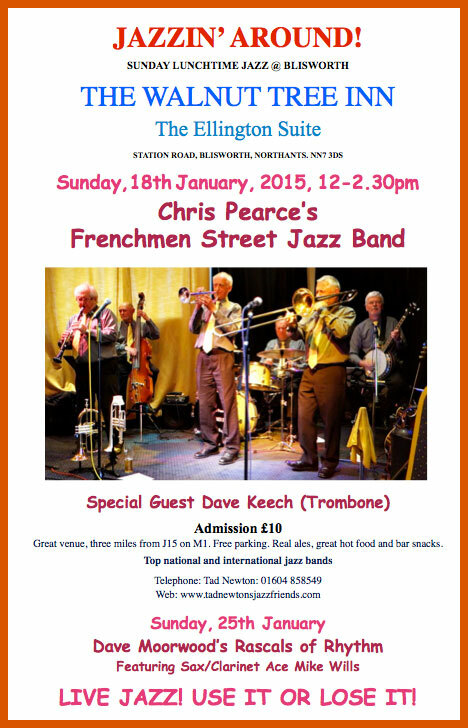 Dave Keech Leads a Jazz Quintet based in Hitchin, Herts. Ian Brameld posted on my Facebook Jazzers Group that I failed to mention Hertfordshire’s Pumphouse Jazz Club in Watford. Even though The Pump House is slightly outside the area under consideration, I apologise because it is a long established, thriving club. Christmas Greetings To My Jazzers Friends Everywhere! 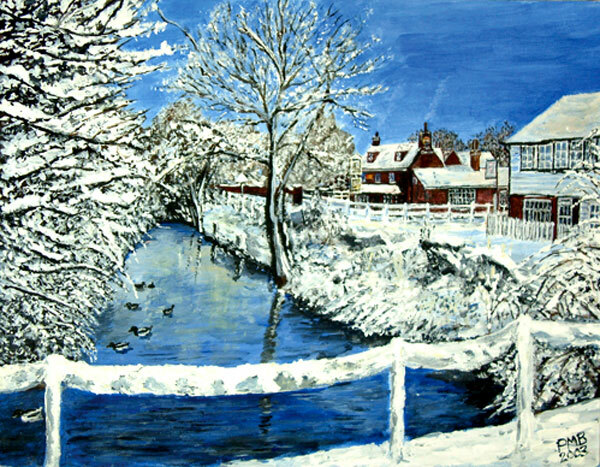 And what better Christmas scene than my painting of The Sun Inn, Lemsford. Especially as Ginny and I returned to the village, our wonderful home for 19 years, and to The Sun to join so many old friends at their joyous village Christmas Party last weekend. Including village jazz man, Bob Thomas of Thomcat Fame. I wrote this poem to go with the painting. Perhaps it captures the warmth of Christmas conviviality. My very best wishes to you all for Christmas and The New Year! Welwyn Garden City, Hatfield and Potters Bar, were once tops for sensational jazz in Hertfordshire. Then came the demise and jazz fell out of favour with the onslaught of rock, pop and, dare I say it, rap! 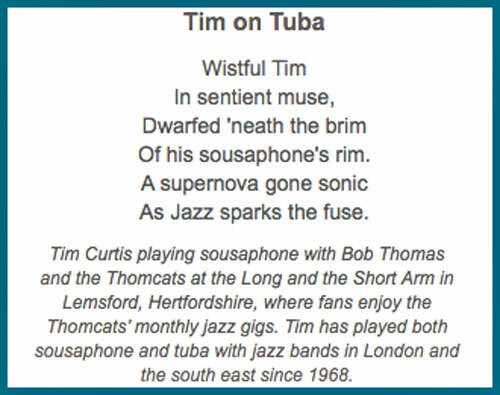 But for a full decade Bob Thomas kept jazz alive in the small retreat of Lemsford Vlllage, no more than a hamlet just west of Welwyn Garden City, with guest bands and his very own Thomcats. Alive that is until Mcmullens switched landlords at “The Long Arm Short Arm” Public House. Smiffy on washboard with Dave Rance’s Rockin’ Chair Band. It was then that Brian Smith, aka “Smiffy” took up the cudgel. 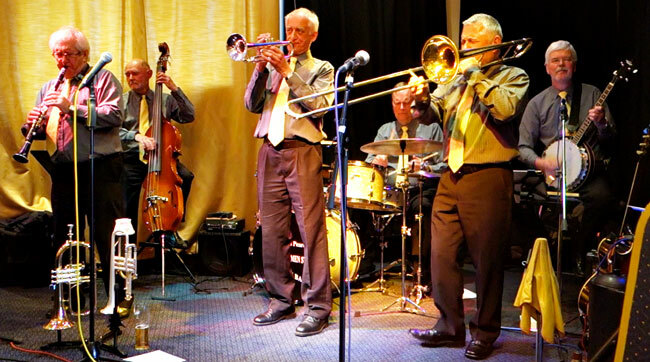 At first he got jazz going again in Welwyn Garden City, moving from one pub to another and finishing at The Peartree, with The Peartree Jazz Club. He staged some great bands there and for some three years the club was well supported. Then circumstances changed. But Smiffy didn’t give up. To the contrary, he decided to bring jazz back to Lemsford Village. And why not because Brian was born in “The Long Arm and The Short Arm” – it’s former full name. But this time his objective was jazz in Lemsford Village Hall. 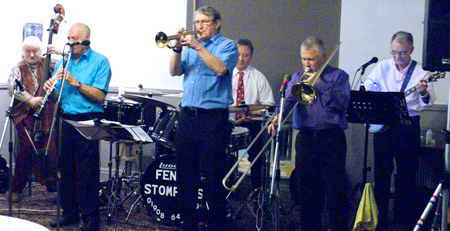 The first gig was on Sunday, 24th August, with The Frog Island Jazz Band. It attracted a good turn out of fans and was a hugely promising success. 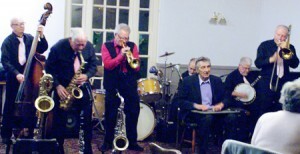 Next on the bill is Dave Rance’s Rockin’ Chair Band on Sunday, 21st July from 1.00pm till 4.00pm. Starring with him will the remarkable John “The Professor” Percival, famed for his Singing Saw. 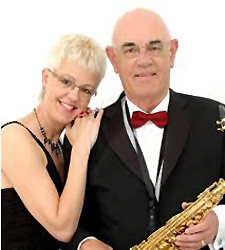 So a special message to jazz fans, why not get along to The Lemsford Village Jazz Club on Sunday, 21st September and help revive jazz in Hertfordshire by supporting Brian Smith. Because in my book “Smiffy”, is truly a Jazz Hero. 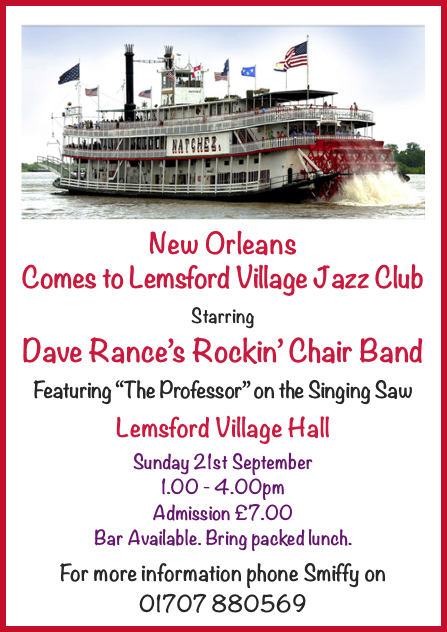 Scroll down for the YouTube of The Frogs at Lemsford Village Jazz Club. Washboard trio: Smiffy guesting centre stage with Barry Palser’s Savoy Jazzmen. Having recently posted the item “Jazz Clubs & Ageing Fans”, this is currently very much on my mind. So Jeff’s comments stirred me into an interview with Brian Smith which I had intended to complete some time ago. Known as “Smiffy” to his friends, and for me an unsung Jazz Hero, Brian founded and manages The Peartree Jazz Club in Welwyn Garden City. Peter Butler: Smiffy, tell us a little about your background and what got you into jazz. 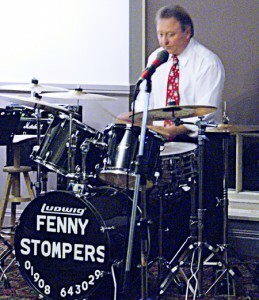 Smiffy: I was born in The Long Arm and Short Arm pub in Lemsford Village just outside Welwyn Garden City, long enough ago to have followed some of the great jazz bands on the 1950s and 60s. Those were the days when Hatfield, Potters Bar, Enfield and Welwyn Garden City were hot beds of jazz. Terry Lightfoot and Acker Bilk used to live in Potters Bar. Bernie Tyrrell led the Salisbury Stompers in Barnet (the pub is now a Sainsbury’s). PB: So you first got into jazz back then? Smiffy: Yes. 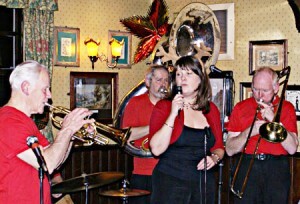 At two venues in particular, The Red Lion in Hatfield and The Cherry Tree Club in Welwyn Garden City. Sadly the Cherry Tree was demolished some years ago to give way to what is now a Waitrose Supermarket and The Red Lion no longer does jazz. PB: I understand you “dabbled” in promotion back then. Smiffy: Yes, at The Cherry Tree. But not so much jazz promotion as popular entertainment. PB: You’ve told me your experience back then has a bearing on your thoughts now but I’ll come back to that later. Let’s skip to the 1990s because I believe that then The Long and The Short Arm hosted jazz sessions. Smiffy: Yes, jazz came back to Lemsford Village, just outside Welwyn Garden City. Your and my good friend Bob Thomas launched weekly gigs there for his own band, Bob Thomas & The Thomcats, and a number of guest bands. It proved highly successful for a good ten years or more. But then the brewery switched landlords twice and jazz was ousted from the pub. PB: Jazz ousted from your local, the pub you were born in! So yet again the fans had nowhere to go. But you decided to do something about that? 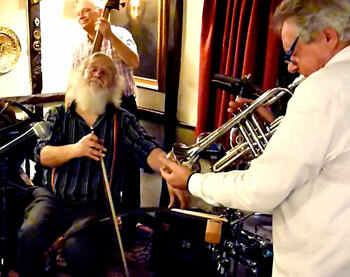 Smiffy at The Peartree on washboard with Dave Rance’s Rockin’ Chair Band. Smiffy: That’s right. I asked other pubs in the vicinity if they were willing to stage jazz and that’s how The Peartree Jazz Club got started about three years ago. The Peartree Public House is pretty central for Hertfordshire fans, located in Hollybush Lane, Welwyn Garden City, where we now hold jazz gigs on the third Monday of each month. PB: Out of your own pocket? Does the entrance fee cover your costs? Smiffy: It’s not easy but I love jazz and the fans missed it. Football once a week was expensive enough so I’ve given that up! I chose a Monday because most people don’t have anything else on that night. Entry is £7 a night but I’ve now set up a club membership at £5 a year whereby members will still pay £7 but non members will be charged £8 or more depending on the band. That should help to build up attendance and takings to cover costs and might even fit in with my plans to move to two sessions a month later this year. PB: What do you think it would take to attract fans from a wider catchment area and get more bums on seats? Smiffy: Quite frankly big name bands but they are few and far between now. Terry and Kenny are gone. A club like The Peartree couldn’t afford them anyway. PB: But let me come back to your experiences in your earlier days in promotion. You mentioned to me once a magic formula which worked back then. Smiffy: Yes. I wanted to boost popular entertainment attendances at the Cherry Tree in Welwyn Garden City. I wanted a big name comedian who the local press would headline because I thought that would bring out the fans. Through contacts and good fortune I was able to book Bernard Manning at a concessionary rate. So then I didn’t need to advertise the event. The local press did that for me and the Cherry Tree was packed full to bursting that night. I even made a small profit. I’d love to do the same for jazz at The Peartree before it’s too late, but who have we got left? Chris Barber’s band, or perhaps Kenny Ball’s Jazzmen now led by Kenny’s son Keith. Or Bill Kerr’s Whoopee Jazz Band. Terry’s daughter Melinda is continuing the Lightfoot tradition along with his grandsons. We could double bill with a more local band. That would bring the fans out and hopefully help increase club membership. PB: But we’re still talking about older fans, and as my pal Jeff Matthews put it, in the next five years a vast swathe of that loyal audience will disappear. How about younger bands? Smiffy: Well, you and I have been working on that, but haven’t been able to follow up on our leads so far due to recent commitments the musician we’ve been talking to has taken on. PB: That’s right. Unquestionably there are a number of younger bands out there with solid fan bases in their own age groups. But they are mainly in London, Liverpool and other hot locations. 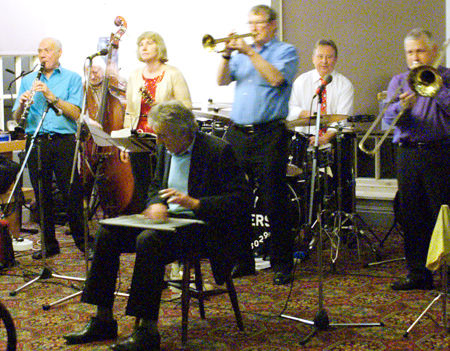 Getting them to play to older fans at jazz clubs like The Peartree wouldn’t be easy. Plus they would want and deserve good money. Smiffy: As your pal Jeff put it, older audiences might like to see young musicians in older bands but they also prefer bands that are generally around their own ages. PB: Not much hope there then for the future of New Orleans jazz? Smiffy: I think it’s going to take more than a small club like The Peartree to ring the changes, but I would still be willing to play a part and give it a go. If we could beef up membership and enthusiasm we might yet be able to book younger bands who might even bring along some to their own fan base. With the right publicity we could even attract University of Hertfordshire students. That would liven up our old faithfuls! But would it put them off? Somehow I don’t think so. PB: If Hemsby last year was anything to go by you’re right. The Rich Bennett Band, average age around 33, were booked to star at the Autumn Parade. But you could tell the organisers were wary of how they would be received from their announcements on the preceding day. They need not have worried. The “elderly” fans took this dynamic young band to heart and swarmed to the stage to meet them after their sessions. Their CDs sold like hot cakes. Smiffy: I’ve heard that the idea of a Festival for younger bands has been broached on your Facebook Jazzers Group. PB: Yes, it would be great if that could be followed up. Smiffy: I hear you were at the 100 Club recently for a session with The Martyn Brothers Band. PB: Yes, early in April. The Martyn Brothers, another younger band. Bob Thomas came along with me and Sammy Rimington guested with them. To see him playing alongside Adrian Cox on clarinet and sax was inspiring. Bob spoke to Adrian and compared him with Bruce Turner which he took as a compliment. Smiffy: The trouble is these younger bands build up fan bases and promote themselves via Facebook etc very successfully. Their gigs are alive with LindyHop and Swing dancing. What you and I have been talking about is luring all this further afield – even into the provinces and, dare I say, beginning with centres like Welwyn Garden City. PB: I mentioned the thought of a Festival for younger bands to Sammy Rimington but that some had suggested older band(s) should also be involved to guarantee punters. Sammy didn’t think much of the idea of including older bands but suggested prominent guest musicians could be invited to play with the younger bands. Smiffy: You and I have been talking about all this for the last six months. I’d love to play a part and get The Peartree involved. After all, Welwyn Garden City is within easy striking distance of London. But the big hurdle would be finance. We are still building up the Peartree’s fan base but currently its still nip and tuck. I’m getting calls from a good many bands now wanting to play at the Club. I’m the first to admit they are well worth their asking price, but without a strong fan bass I can’t afford to pay the big names top whack. But wouldn’t it be wonderful if we could break the “ageing cycle” and get the youngsters involved again! As your pal Jeff said, “this has to be addressed”! I have been a fan of New Orleans jazz for most of my life and my first 78rpm record was Louis Armstrong playing “Basin Street Blues” which I bought in the late 1940s and still have today. I moved into my first house in 1956 in Potters Bar and a short while later whilst walking down Sunnybank Road where we lived I passed a house from which came a god awful noise which sounded as though someone was attempting to squeeze jazz out of a cat. This turned out to be the embryonic Terry Lightfoot jazz band which to my amazement and delight, very quickly developed into one of the finest traditional bands in the country alongside the likes of Humph, Acker, Kenny and Chris. Later I got to know Terry and Iris mainly through supplying them with new and used cars and also servicing their cars as well as the Lightfoot Band Wagon at my garage in Chalk Farm Road, Camden Town. I remember when Terry and his Jazzmen were touring as the support band with the Louis Armstrong Band. He gave me and some of my mechanics complimentary tickets to their gig at The Odeon, Hammersmith. We were servicing the Band Wagon earlier that same day, and typical to band wagon tradition the floor was littered with beer cans and comics. I told one of my staff to sweep it out but unfortunately the double bass had been left in the van without its cover. An employee took the bass out and rested it against the side of the van. To my horror the wind blew it over, breaking the finger board off. We managed to glue it back into place but then spent a very tense evening at the gig watching the bass player slapping away rhythmically, fearful that the finger board would fall off at any minute. Being I self confessed coward, I “forgot” to tell Terry about this incident. My favourite number that Terry Lightfoot and his Jazzmen played was “Dans les Rues D’Antibes” by the great Sydney Bechet which is a favourite of my band, “The Thomcats” to this day. I look forward to the day when I will be up there with that jazz band in the sky and all the wonderful people like Terry, Kenny and Pat, who have given us so much pleasure over the years. Come on you young musicians, just listen to these guys’ music. I assure you they are infectious and you will not be able to resist getting involved. Editor’s Note: Perhaps the most appropriate YouTube to accompanying Bob’s thoughts is this one starring Terry and his Jazzmen along with his daughter Melinda. 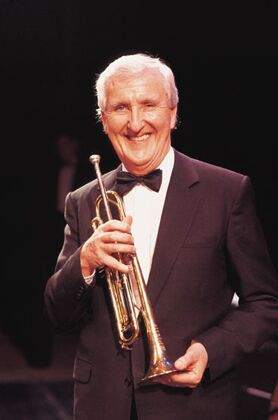 Fred Burnett has also posted a Tribute Page to Terry on Jazz North West. Photo courtesy of Melinda Lightfoot. I replied, “There are, Ray, but admittedly they are few and far between. But that is changing as this feature and other posts in Jazzers show”. “We strive to promote youngsters in jazz, but I did get irritated when we received notification of the National Youth Summer School to publish. Great in principal but any youngsters wanting to attend are confronted with various criteria, funding applications, bursaries and more off-putting auditions. More importantly, I do not see any provision where youngsters will be instructed or lectured on the era of jazz which we promote and that our readers enjoy. It seems most young musicians who will attend will have already attained some level of proficiency. I do hope their teachers haven’t ignored Armstrong, Morton, Ory, Henderdson, Russell, etc! Clare Gray was first to respond, commenting with a link to http://swungover.wordpress.com and an article on A Quick Note On Training Bands To Play For Dancers. IT’S TIME FOR JAZZERS TO GET INVOLVED! Time to reinforce the aims and goals of Jazzers and Jazz&Jazz.com. “The art of life is to know when to seize on accidents and make them milestones.” Chairman Humph. (A gem from Humphrey Lyttelton’s autobiography, “It Just Occurred to Me”). 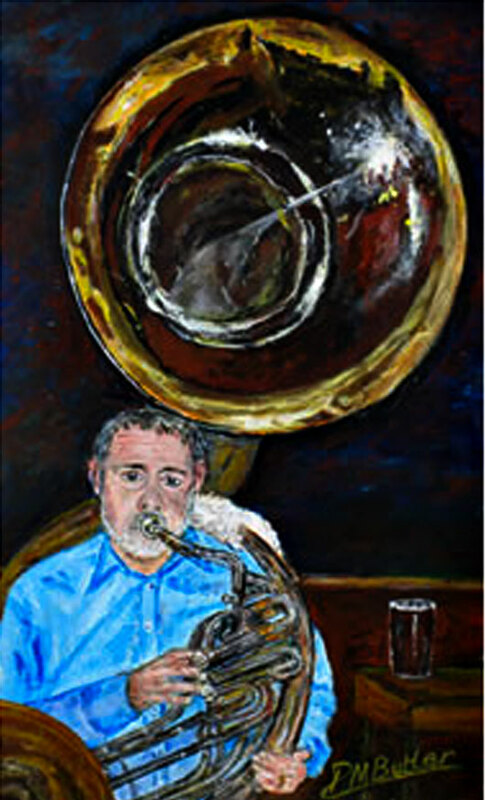 I stumbled back into jazz just a few years ago, started to paint portraits of jazz musicians, joined the Southern Sounds New Orleans French Quarter Festival tour in 2010, and realised that jazz has reached a woeful low in the popularity stakes. Frankly put, with ageing bands, musicians and fans, if action isn’t taken soon, jazz and in particular New Orleans jazz will simply fade away, even in New Orleans. Yet there are younger bands, musicians and fans out there to carry the torch, and they need all the support and encouragement we can give them if they are to stay on track. One solution lies in the forging of relationships between the “oldies” and the “young’uns” – bands, musicians and fans! Cross fertilisation of the skills and thrills of jazz … forging a partnership between older, well established bands and dynamic younger bands and setting a pattern for bringing New Orleans back to the UK. But it’s not just a matter of watching this space. We want members of the Jazzers Group to get involved. How? By inviting bands, clubs, musicians and fans to join Jazzers and work together to achieve a not so impossible lift off to a sustained revival of New Orleans Jazz, the source of all of our popular forms of music. I would welcome a proliferation of posts along these lines from north, south, east and west. Let’s get the show on the road. Read the “About” section of Jazzers. It has more to say about these goals. Martin Bennett As a generalisation, one of the main reasons for what seems to be a lack of interest in the young, is the venue itself. Most of the venues are places modern youngsters wouldn’t be seen dead in. Places full of chairs and tables are of no interest to them. People under 25 prefer to stand – as you will see at festivals and many jazz clubs in Holland, all of which have cheering youngsters to a point of overflow – places where the over 40s wouldn’t want to be seen dead in here in the UK. Peter Mark Butler A very valid point, Martin, which we need to pay attention to! 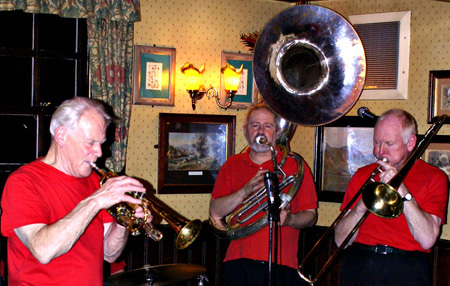 Such limited venues include pubs yet even pubs are turning jazz away these days. But fans are not prepared to pay sufficient for their jazz to make that difference. As Pete Lay recently wrote to me: “That is why the audience mentality has to change, and it will do, if we can get the younger audience on board – they are used to paying for their nights out.” Somehow we must learn from Holland and Germany. Perhaps it will take a concerted effort to get daring with venues! 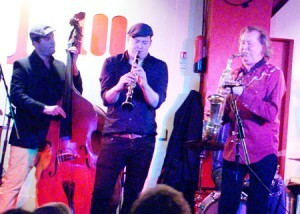 In fact I included a post on Jazz&Jazz recently based on developments at the Leeds Jazz Club addressing just this point: http://www.jazzandjazz.com/?p=2206 Perhaps we should check up on how Leeds is doing now. Martin Bennett Leeds Jazz Club runs a Jump Jive dance group in conjunction with the jazz nights. It works very well and all of the Jump Jive dancers are under 30. There is a similar group of dancers from Greater Manchester which turns up at clubs suitably set up. There are no clubs I know of in Manchester working on a regular basis so they have to travel – usually to Jump Jive Bands. Leeds has it sorted. Peter Mark Butler I believe Jeff Lewis and Speakeasy Bootleg Band are doing something similar in Liverpool, so it can happen. We need to get more on board! As I’ve stressed in my Just Jazz articles and on Jazz&Jazz, fans and even bands must learn not to be so precious and be prepared to “mix it a bit” if traditional jazz is to regroup for a revival. Clare Gray Jive swing and similar is absolutely thriving at the moment – go to the TwinWood website http://www.twinwoodevents.com/index.html to see what they have on and pics of this year’s great events. We went and although big band is a different ‘fish’ to what most folk in this group are aiming at, there were some other decidedly more jazz-orientated bands there also, as well as a lot more of the 50’s vibe. I’m not suggesting Twinwood is the ideal venue for Trad, Dixie etc, but I think it’s likely that the young ‘keenies’ that we meet at our LindyHop classes will naturally progress to the cooler shades of jazz – in fact I am noticing a lot of them ‘liking’ tracks and bands that definitely are smoother and just as good for them to dance to. So the upshot is, keep the music alive and as public as possible. Keep on pushing it out there and they will come. I agree that it might be that pubs are a dying source – they’re up against so much attack on their profits (non smoking, rising beer prices, more people drinking at home etc) that they can’t really take a punt on bands that might not bring in the drinkers (a lot of these youngsters only drink softies anyway these days – horrors!- whatever the media says about binge drinking). So perhaps the secret is to start looking for big, open venues where jazz events might be held and start building it from there. There is interest in dinner jazz from smaller restaurants and while I know that some bands might blanche at that idea, its all getting the good stuff out there, so don’t knock it if you can get it. Twinwood Festival is The No. 1 Vintage Music & Dance Festival! www.twinwoodevents.com Twinwood Events hosts the annual Glenn Miller Festival and Rhythm Festival at the historic Twinwood Airfield. Martin Bennett Jeff’s a good chap and certainly does his bit over in Liverpool and has developed a wider range which works very well. Clare Gray Good for you Peter. With your determination and contacts you’ll get this party started! Am really hoping the scene starts to open up a bit soon. I’m itching to get into something new – using the Trad, blues, dinner, dance band and other ‘grooves’ I’ve got into since the late 90’s. I’m determined to find some folk to enjoy that with. As a ‘younger’ jazz fan I find it frustratingly difficult to break in with the hardened older players who seem to enjoy ‘noodllng’ (nothing wrong with that) but don’t really want to gig or to push it much. Can’t say I blame them, but where are all those players who want to make a noise??? Get them out of the woodwork and you’ll start a fire!…..
Chez Chesterman Trouble is, if you mention the word jazz the kids will not turn up. To them jazz is a naughty word. Call it swing, play the right tempos and they’ll come flocking in. Forties swing is the one that gets everyone hopping. Clare Gray I agree. Amongst my fellow jive swing/lindy dancers (many quite a bit younger) there’s a nose-wrinkling at the ‘J’ word – yet they’re tapping their feet and swinging along to it all the same. Perhaps you’re right – give it a different hat and they’ll all want to put it on! Dave Mayor Members of the Bude Jive club also belong to the Bude Jazz club, most welcome they are too. Peter Mark Butler It seems all is not lost. Yet, taking the comments received so far, there is a long way to go. To Chez and Clare I’ll respond with a conversation had at the Hemsby Autumn Parade last year. Barry Price asked the girls serving behind the bar if they liked jazz. “No!” was the answer. So, pointing to the stage he asked, “Do you like this kind of music?” And they said yes they did! So he told them this was original, traditional jazz. So the jazz that put them off could well have been ultra modern jazz – you know, the self indulgent stuff you can’t even tap your feet to! Clare Gray Funny you should say that Peter. When I first started doing the Trad stuff with Bob Thomas, a friend and former colleague laughed when I told him and said “you’re not doing all that dreadful scatting stuff and singing to Shakespeare sonnets are you?” He thought it was hilarious and took the mickey whenever I said we had a gig . One day I was playing some trad in the car when he came with me on a business trip. He was really enjoying it and I turned and said “this is what we do”. He was quite impressed, and although I would never say he’s going to be listening to it by himself, he came along to a gig and had a good old time. I was a bit worried I might offend the group mentioning the truly ‘modern’ jazz, but in my opinion it is that stuff – where no one is playing the same tune or in the same key it seems, and the drummer appears to be building flat pack wardrobes in the background – that puts people off sometimes. This probably makes me sound like a total Philistine, but if we want to draw people in, we must start with what good old Bob calls ‘Happy Jazz’ as well as ‘Dance-y Jazz’ and then we have a better chance of keeping this bird in the air. Peter Mark Butler I’m keeping this vital debate on the boil on Jazzers for more members to have their say. I will also cross reference it to Jazz&Jazz.com and invite followers’ comments there. We’ve reached the blatantly obvious conclusion that if “traditional” jazz is to make a comeback we, fans and musicians alike, need to be less precious about the purity of the genre. I’m all for “mixing it a bit” and am not against mainstream per se, but we shouldn’t forget the roots of New Orleans jazz and of jazz dance, because I believe if that could be reintroduced the kids would go for it and follow jazz, even if they adapted the dance styles to their own modern tastes. “New forms of jazz dance developed with new music, such as the Charleston, swing, rock and roll, and the Caribbean reggae” (Dancin’ Unlimited: http://goo.gl/X1lOu). Jeff Matthews I named my band ‘The Chicago Swing Katz’ because the word ‘Jazz’ has a bad name with many people. Very sad really. I have left ‘jazz’ concerts early because even I was bored with the music. And I am an enthusiast of all kinds of ‘jazz’! Jim Lodge For me, part of the problem seems to revolve round the “purist” attitude. Some bands and listeners (and some musicians) project an “if it isn’t a carbon copy of (insert original of choice) it’s wrong”. This leads to a situation where we end up with a glut of what “Popular Music” refers to as “Tribute Bands”, and their musician equivalents. Such a path can only lead to a joyless stultifying conformity, without life or excitement. Jeff Matthews Ref: Jim’s purist comment, I know musicians who say that “if you are not black and born in New Orleans before 1939, you don’t play jazz”. My trip to New Orleans to attend the jazz course there showed me that many purists are equating all New Orleans jazz with the revivalist Music they heard which didn’t reflect all the different jazz and characters involved. It was a city filled to the brim with music of all kinds played by musicians of different technical abilities. Most had remarkable facility and many were highly proficient music readers. They had to be in order to survive. And there is room for all styles. It’s all wonderful music. Tim Penn Well Jazzers – I think this may be what Peter may be talking about: http://www.youtube.com/watch?v=9esH2rw-wF8&feature=g-upl Note – saxophones and electric bass!!! And this was preceded by a version of Junco Partner and followed by Ray Charles’ ‘What I Say’ (His birthday on Sept 23rd – so we paid a few tributes this night). The evening finished off with a funky version of The Meters Hey Pocky Way – which veered off into using some of the Miles Davis “So What” minor inversions and a little bit of Cecil Tayloresque Free Form piano over the Funk. Is this a step too far for the traditional audience for Jazz? I guess only time will tell. But many of us see this 20th century evolution of New Orleans based music as something to be celebrated and embraced. But then I remember my dear departed friend Mac McGann telling how he was summarily kicked out of the trad jazz band he was playing in in the late 50s / early 60s – because he brought a guitar along to a gig instead of the tenor banjo. Peter Mark Butler Right on the mark, Tim! If jazz is to make a comeback fans have got to accept change, or as I put it, “mixing it a bit”. After all, the story of jazz has always been about improvisation, mixing it a bit, and it’s no different today. Especially if we are to appeal to younger fans. Peter Mark Butler An elderly fan recently cornered me to voice his criticism of a particular very impressive trombonist for being too flamboyant, “not subtle enough, not smooth enough.” At that very same gig I heard a youngster asking his mother if she could she buy him a trombone because “I want to play jazz like that!” This speaks a thousand words! Because jazz isn’t inert, it’s exuberant, dynamic as well as soulful. Jeff Matthews May I add to the discussion by first stating that a style is a style. New Orleans, traditional jazz is a style and different sound hewed out of the western scale by years of experience and love. Although originally from New Orleans, it was developed and embraced by people around the world. It is still extremely popular wherever it is played. But since the demise of Louis Armstrong as Ambassador for jazz and in the UK, the finish of Kenny Ball’s appearance on TV in the Morecambe and Wise show, traditional jazz has had no profile. You can have the best product in the world but if nobody knows about it….! There are many forms of trad played up and down the UK to enthusiastic fans but it is almost a forgotten style of music because of the deliberate culling of music in other forms, apart from ‘pop’ music which is played ‘for the many’ for the financial benefits of the few. The wonderful interpretation of traditional jazz by Brian Carrick is just as valid as any other even if it’s band members and fans are in the senior part of their lives. Age is not the issue nor is whether a sax is acceptable. Most bands are well past that point. Let’s just play the music. But, what is true and to me is the null point of all of this is promotion. Not a changing of the music to accommodate ‘pop’ culture, but a promotion of the best elements of the music to the general public which consists of people of all shapes, sizes, colours, education and age. We need some of the ‘names’ in trad jazz to step forward and promote New Orleans/Traditional/Dixieland/Chicago style jazz. Call it what you may. A new set of ‘Ambassadors for the Tradition’. Where are you guys? All that ‘ageing audience’ stuff will take care of itself if the music is brought back into the public eye. Get some good looking musicians ready who play the music well – not bending it to rock ‘n roll – but playing what we already have with heart and conviction. Then get those ‘names’ involved. Where are you Jools Holland? Where are you Jamie Cullum? Stop mis-educating people about what real jazz is and stick to some time honoured definitions. It’s time for us jazzers to start influencing our ‘world’ and look for ways to insist that we have a cultural right to play and ‘broadcast’ our musical art. Time to make the general public aware of our music and embrace it once more. The rest will follow. And there will be bands in the Ken Colyer mode as well as those who will play jazz in a more R&B way. But people must hear it and have a choice. By the way, there are already enough ‘knock out’ musicians in the UK, young and old who already hold the professional stage. Let’s get THEM heard on jazz shows and on TV shows. Good presentation, good arrangements, good foot stomping tunes, that infectious NO rhythm. We did it in the recent past. Why not now! BETTER YET: HERE’S A CHALLENGE FOR STAR BAND LEADERS, FOR ACKER BILK, CHRIS BARBER, TERRY LIGHFOOT AND SAMMY RIMINGTON. FOR THE SAKE OF NEW ORLEANS JAZZ, TO GIVE IT THE MASSIVE REVIVAL IT NEEDS AND ENSURE IT’S FUTURE, HOW ABOUT SHARING YOUR ENDURING FAME WITH THIS YOUNGER GENERATION OF MUSICIANS? BECAUSE THERE ARE SOME GREAT YOUNG BANDS READY FOR THE FULL BLAZE OF THE SPOTLIGHTS. SO THE CHALLENGE IS TO SHARE YOUR STAGES WITH THEM, TO BUILD ON THE PUBLICITY THIS WOULD ATTRACT AND SO LAUNCH A JAZZ REVIVAL TO DEFY ANY BBC CLAIMS THAT “JAZZ IS DEAD”. AND PLEASE REMEMBER TIME IS NOT ON OUR SIDE, SADLY KENNY BALL PASSED AWAY THE VERY DAY OF POSTING THIS DEBATE – 23RD MARCH, 2013. Upon hearing about Pat’s passing, my close friend and neighbour Bob Thomas wrote this very touching tribute to him which I am delighted to publish in Jazz&Jazz. It’s a strange old world when you think how it is that a man with so much talent as Pat Halcox can pass away as he has. One tends to think that such wonderful musicians will go on giving us so much pleasure for ever. 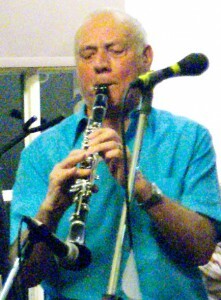 I first met Pat in the late sixties when as cornetist with the Potters Bar Brass Band I had a burning ambition to play jazz music. At the time I was running a garage in Chalk Farm, Camden Town, and needed to obtain a long cornet in order to fulfil my ambition. I worked close to Lawbacks the brass instrument repairers in Kentish Town so I called in to ask for some advice. 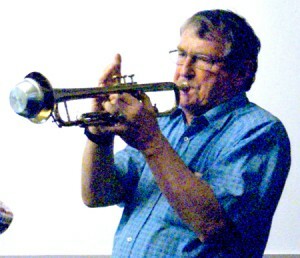 They told me Pat Halcox had a trumpet which he wanted to sell and so I contacted Pat at his home near Hanger Lane. The instrument turned out to be a Doc Severensen Getzen trumpet and although not quite what I wanted, it was such a beautiful instrument I couldn’t resist it and so I bought it. Unfortunately some time later the Getzen was nicked from my car! During the negotiations for the trumpet I had the temerity to ask Pat if he could spare the time to give me a few lessons. To my surprise and delight he agreed and so began my association with him. I remember that at the time he had been waiting for the delivery of a Benge long cornet which was being hand made for him in America. But unfortunately when it was being delivered to him the cargo in the aircraft shifted and crushed his new horn. Both Pat and Kenny Baker were equal to any trumpet players from America or anywhere else in the world and I am sure that their loss is a sad blow to all jazz musicians. Old jazzers never die, they simply blow away. L to R: Trefor Williams, Dennis Vick, Dave Marchant, Ken Joyner, Richard Leach and Brian Vick. 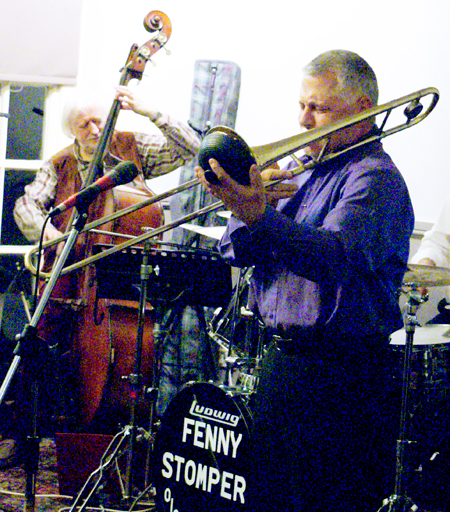 Whenever Dennis Vick’s Fenny Stompers put on a gig at Welwyn Garden City’s Peartree Jazz Club fans turn out in force, sure of an evening of top rate jazz and entertainment. 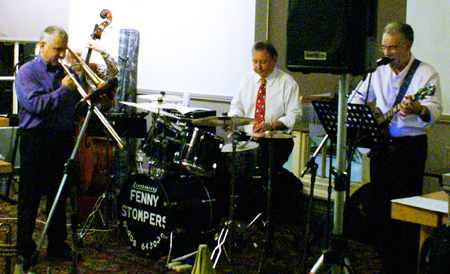 So no surprise then, when on Monday, 17th December, the Fennys staged a breath taking Christmas Jazz Spectacular. 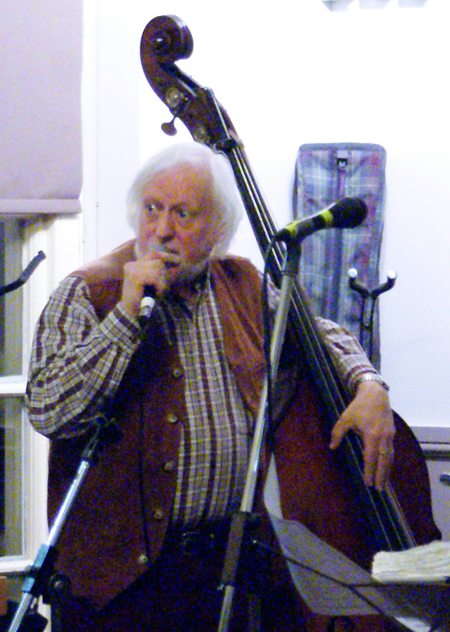 And yet, yes, a surprise was sprung on the Peartree fans when two big name guest stars joined the band, Richard Leach on trombone and Trefor “Fingers” Williams on Bertha, his double bass. To top it off, Smiffy, the Peartree’s very own Washboard Rhythm King was up to his usual pranks, although thankfully the band condescended to only one number. Even so, as is the norm on such occasions, his nimble thimbles evoked thunderous applause. 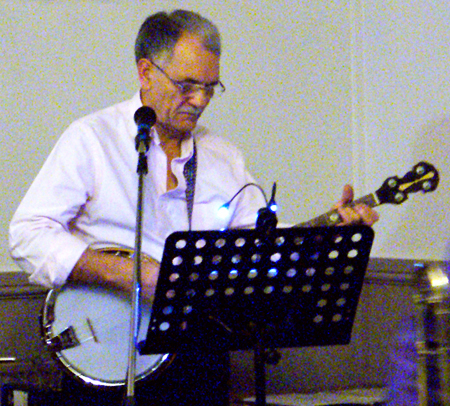 “Had an excellent night at the Peartree last Monday. 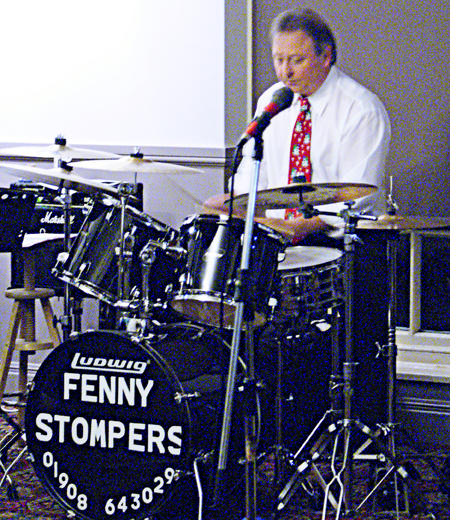 Thank you to the Fenny Stompers for making me so welcome; Dennis, Brian, Ken, Dave, my old mate Richard, and especially bass man Dave. A good time was had by all. “Well done for all the hard work in promoting our beloved music, Smiffy. You are a legend ! Many thanks to Peter and his wonderful wife, for their hospitality. You’re diamonds! It was also good to have a natter with the legendary Bob Thomas. But now we’ll let the photographs tell the story. The Peartree’s very own Washboard Rhythm King! Time for a makeover Trefor?